A book examining the development of national legislative regimes for the protection of intellectual property rights in the Arabian Gulf states has been launched at the Northern Territory Supreme Court. Author and Charles Darwin University Law Coordinator, Dr David Price said the book, based on his professional experience working in the Arabian Gulf region and his PhD from CDU, examined the development of intellectual property rights in Bahrain, Kuwait, Oman, Qatar, Saudi Arabia, the United Arab Emirates, and Yemen. “A particular focus of the book is on foreign forces which have shaped or influenced the character of the states’ intellectual protection regimes,” he said. “The intellectual property laws of these Gulf states have been developed virtually in a single generation. 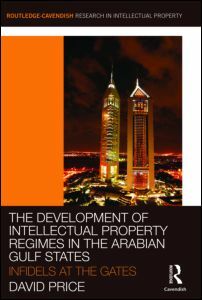 The book includes commentary on the contribution of foreign states, the World Intellectual Property Organisation, and the US bilateral trade strategy in particular for pursuing intellectual property protection standards that exceed those enshrined in the WTO multilateral agreements on intellectual property rights, and the impact of these forces upon the states’ enforcement performance. ‘The Development of Intellectual Property Regimes in the Arabian Gulf States: Infidels at the Gates,’ was launched by NT Chief Justice Brian Martin at the NT Supreme Court in conjunction with CDU’s Law prize night.